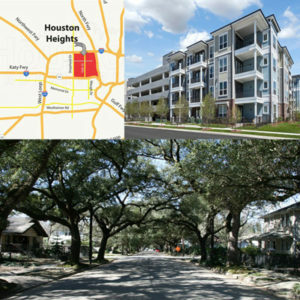 Houston Heights, or just “The Heights” to people in Houston, has one of the longest histories in the city, dating back to just before the 20th century. The area was originally bought up by millionaire tycoons who saw the land as prime residential real estate. The area flourished soon after its establishment, drawing people who wanted to escape the activity of nearby downtown Houston. Its history hasn’t always been a glorious, happy one, as the area was wracked by economic downturn following World War II. During the 70s and 80s, The Heights was among the lowest income areas in the city, and certainly not a target for people moving to the area. However, the 90s brought a reversal of fortune for the area, and to the inner 610 Loop at large. Rapid development coursed through The Heights, spurred by the mass movement of younger professionals to the city. Their arrival drove up demand for improved services and housing, and historic homes were renovated to attract discerning buyers. This development is ongoing, as The Heights remains one of the most active parts of Houston in terms of real estate transactions. Many people want to live in The Heights, and it’s easy to see why. The Heights is unique in that it is a central part of the city, just minutes from Downtown, yet still feels like a sleepy neighborhood. The Heights, unlike most other desirable spots inside the 610 Loops, is mostly residential, with neighborhoods that span the distance between I-10 and the north side of the 610 Loop. The community is surely not without its own interesting restaurants, shops and hangouts, but it is clearly a residential zone first and foremost. This makes The Heights a perfect area for families, and particularly those who work in Downtown or nearby. The Heights is a bit amorphous, depending on who you ask, but most consider its boundaries to be I-10 to the south, the 610 Loop to the north, I-45 to the east and the 610 Loop again to the west, though some consider its western boundary to be around TC Jester Blvd. The exact dimensions don’t matter, because the area’s neighborhoods melt into each other, and The Heights offers up one of the more interesting collections of homes in Houston. The area is a mix of recent development and historic homes, so it’s not unusual to see a home from 60 or 70 years ago up against a collection of urban lofts. This is seen in the area’s businesses, too, as many of them are built into renovated warehouses and garages. It’s the kind of modern look that many young professionals are drawn to. And young professionals are also drawn to the area’s eclectic restaurants, bars, cafes and shops. The 19th Street strip is a primary gathering spot for people in the area, as it provides a walkable area laced with places to eat and quirky places to shop, including several antique stores. Although Montrose may claim the art title of Houston, The Heights has several art galleries of its own, as well as an overall artistic focus. It’s not the bohemian type of art that Montrose is known for, but skews contemporary all the same. There are more than a dozen art galleries in The Heights or just outside its boundaries, so art lovers will have plenty of opportunities for enjoyment. Further, the area’s central location means it is close to just about every festival that Houston puts on, including the Bayou City Art Festival, the Art Car Parade, the First Saturday Arts Markets that pop up during the summer and the Via Colori Street Painting Festival. But the area doesn’t just belong to young professionals. Families with children are established all over the area’s neighborhoods, which to some, may make The Heights feel like a suburb inside the city. Because there are only a few main roads that run through the area, and large neighborhoods in every direction, there are parts of The Heights that feel wholly separate from Houston, and this tranquility is what attracts many parents. The Heights also has several reputable schools, including Travis Elementary, Harvard Elementary and Field Elementary, all of which are well-supported by the community. In short, The Heights is the perfect, hard to find intersection between urban location and suburban calm. As such, it’s home to a diverse group of people and features a neighborly feel. The Heights is, year in and out, the most active real estate market in all of Houston. People are arriving in droves and the meteoric rise of home values in the area have prompted many to sell their properties and reap the windfall. This is a hotspot for people arriving in Houston, and lucky them, because The Heights is a perfect introduction to the city of Houston. As with many parts of Houston, it’s easy to get lost if you’re not familiar with the area. The Heights is mostly neighborhood, and those neighborhoods can feel like they go on forever, with many twists and turns, as well as the odd dead end. And because parts of The Heights are more than a century old, the streets are narrower than what most people are used to, at least in some parts. Fortunately, a professional mover with experience in The Heights, and Houston at large, won’t be fazed by these difficulties. Everyone who moves to Houston is initially struck by its massive sprawl. But with a reputable Houston mover like JT Melia assisting with the move, there’s no fear of getting lost or being delayed. JT Melia has made thousands of moves into and out of Houston, from and to distant parts of the U.S. and the world. Its crews are ready to step up and assist with a move to The Heights, and get the tough stuff out of the way so you can settle in and experience one of the most enjoyable parts of Houston.